Photo credit: Landscape Structures Inc.
Minneapolis and St. Paul lead the nation in access to parks and open space. But tens of thousands of Twin Cities residents still don't live within a ten-minute walk of a park. Kids growing up in St. Paul's Skyline Tower, for instance, have resorted to playing soccer in the narrow hallways between apartments. This non-profit owned and operated affordable housing complex is home to more than 500 families, many of whom emigrated here from East African countries as refugees. The site is within easy reach of the Green Line Light Rail, accessible to the Griggs Bikeway, and close to Gordon Parks High School, the High School for Recording Arts, many social service providers and businesses. Residents long for a safe place for the community to gather, but the surrounding neighborhood lags far behind the rest of the Twin Cities in access to parks and open space. But not for long. The Trust for Public Land recently purchased five acres near Skyline Tower and transferred the parcels to the City of St. Paul. Over the past few years, we have helped guide the community through the process of funding and designing a brand new, much-needed park. We are excited to announce that much progress has been made! The community engagement and design has been completed and the team in is the process of selecting a contractor. Construction is expected to start in late May/ early June 2019 and the park to be open by fall 2019. The design will include an open field for play, plenty of walking paths, an exciting playground for kids of various ages, full court basketball, gathering areas with benches and tables, an outdoor amphitheater/classroom, garden areas, trees and native planting, mosaics by a local artist, and with the support of Capitol Region Watershed District a signature stormwater feature. The Trust for Public Land is proud to partner with the City of St. Paul, the Union Park District Council, the Lexington-Hamline Community Council, and the Wilder Foundation. 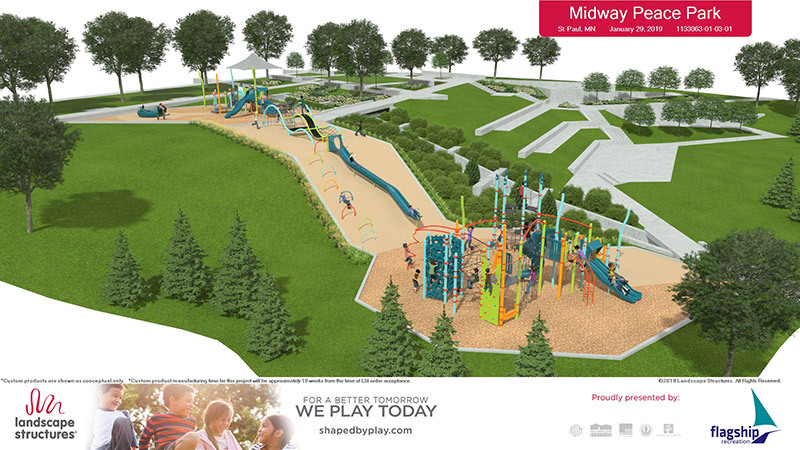 For more information about the design and the process, please visit https://www.stpaul.gov/departments/parks-recreation/design-construction/current-projects/midway-peace-park. Help make this park a reality! Together we can build an accessible, safe, well-designed place for all to play, exercise, and gather!